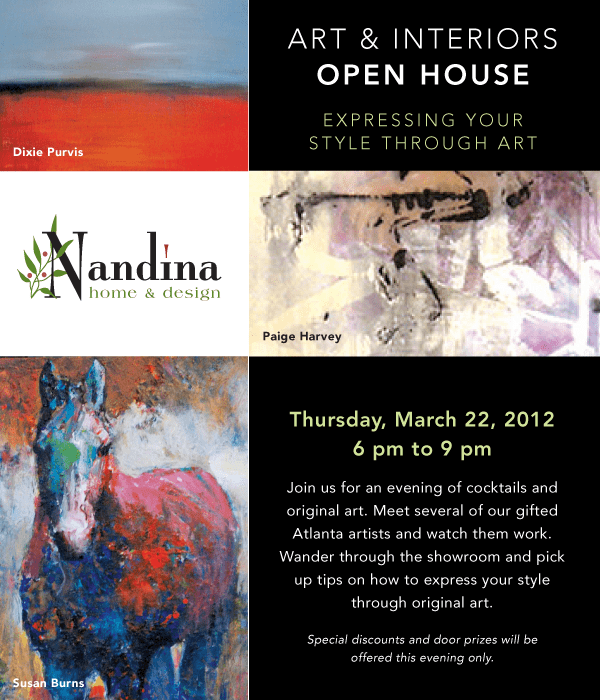 On Thursday, March 22, 2012 from 6pm to 9pm Nandina of Atlanta will feature five incredibly talented artist as we explore how to “express your style through art.” You won’t want to miss this fun filled evening of cocktails and original art. As you sip signature cocktails you will have the opportunity to meet several of our gifted Atlanta artists and watch them work. Our interior design staff will be available to share tips on how to express your style through the use of original art. In anticipation of this art filled event, we will feature each of the five artist and some of their work each day leading up to the open house on Thursday. Atlanta artists Susan Easton Burns, Dixie Taylor Purvis, Paige Harvey, Corinne Adams, and John Ishmael represent a wealth of talent and works that cover a large range of mediums and styles. Be prepared this kind of talent inspires design!